A system Crash: If you’re lucky, it only happens occasionally, more than likely though it will continue to crash as systems rarely fail only once. Rather, they keep crashing until you find the cause and fix the problem. A crash (or system crash) in computing is a condition where a computer or a program, either an application or part of the operating system, ceases to function properly, often exiting after encountering errors. 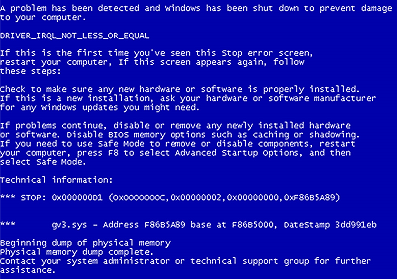 The offending program may appear to freeze or hang until a BSOD details the crash. If the program is a critical part of the operating system kernel, the entire computer may shutdown or reboot. This is different from a hang or freeze where the application or OS continues to run without obvious response to user input. 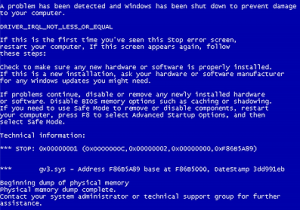 Blue screen messages, often referred to as The Blue Screen of Death or BSOD error messages, affect the Windows Operating System. Generally, your computer screen will turn blue with several lines of white text and then automatically restart. These lines of text actually tell you what is causing the blue screen error. Unfortunately, the screen usually only appears for approximately one second. Diagnosing these cryptic error messages is an art and something we have been doing for many years here at Magnum Computers. If you have a program freezing or your whole system going down, that is not a problem, our MCSE Certified Techs will quickly diagnose the cause of the crash and give you an estimate of what it will cost to repair. Often it is an easily resolved bad Windows Update, Incompatible Programs, Virus, or other Install or Update that is the problem. Call Today! We can solve Error Messages and Windows Errors!